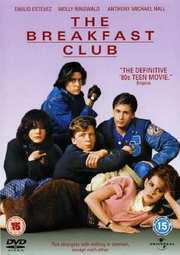 Without doubt, John Hughes` The Breakfast Club is one of the greatest teen movies of all-time, if not the best. Without it, we might not have witnessed the phenomenal rise of the `brat pack`; the group of actors synonymous with the teen films of the `80s. They were five teenage students with nothing in common, faced with spending a Saturday detention together in their High School library. At 7am, they had nothing to say, but by 4pm, they had bared their souls to each other and become good friends. To the outside world they were simply the Jock, the Brain, the Criminal, the Princess, and the Kook, but to each other, they would always be the Breakfast Club. The film`s title comes from the nickname invented by students and staff for detention at the school attended by the son of one of John Hughes` friends. Thus, those who were sent to detention were designated members of "The Breakfast Club".